SAN JOSE, Calif.--(BUSINESS WIRE)--Cypress Semiconductor Corp. (NASDAQ: CY), the leader in wireless connectivity solutions for the Internet of Things (IoT), today announced an updated version of its turnkey development platform for the IoT that simplifies the integration of wireless connectivity into smart home applications. The Wireless Internet Connectivity for Embedded Devices (WICED®) Studio platform now adds iCloud remote access support for Wi-Fi-based accessories that support Apple® HomeKit™. Developers can leverage iCloud support in the WICED software development kit (SDK) and Cypress’ CYW43907 Wi-Fi® MCU to create hub-independent platforms that connect directly to Siri voice control and the Apple Home app remotely. Developers can access the WICED Studio platform, ecosystem and community at http://www.cypress.com/wicedcommunity. “Emerging smart home applications are providing some of the most tangible improvements to our everyday lives, not only giving us the convenience of controlling our lighting, appliances and thermostats remotely, but the ability to manage their usage and power consumption profiles more efficiently—which is a win-win for the environment and consumer pocketbooks,” said Brian Bedrosian, Vice President of Marketing for the IoT Business Unit at Cypress. “Our new WICED Studio development platform lets OEMs bring HomeKit support to their smart home products, enabling Siri control and convenient control using an iPhone, iPad or Apple Watch.” For example, the WICED platform is used in Leviton Manufacturing Co.’s Decora Smart™ family of lighting switches and dimmers with HomeKit support. Using Cypress’ WICED development platform and ultra-low power CYW20719 Bluetooth/BLE MCU, developers can integrate HomeKit support into products such as smart lighting devices, leverage Siri voice control and connect to the Apple Home app seamlessly. WICED Studio provides a single development environment for multiple wireless technologies, including Cypress’ world-class Wi-Fi, Bluetooth® and combo solutions, with an easy-to-use application programming interface in the world’s most integrated and interoperable wireless SDK. The kit includes the market’s most broadly deployed and rigorously tested Wi-Fi and Bluetooth protocol stacks, and it offers simplified application programming interfaces that free developers from needing to learn about complex wireless technologies. The SDK also supports Cypress’ high-performance 802.11ac Wi-Fi solutions that use high-speed transmissions to enable IoT devices with faster downloads and better range, as well as lower power consumption by quickly exploiting deep sleep modes. The Cypress CYW43907 SoC integrates dual-band IEEE 802.11b/g/n Wi-Fi with a 320-MHz ARM® Cortex®-R4 RISC processor and 2 MB of SRAM to run applications and manage IoT protocols. The SoC’s power management unit simplifies power topologies and optimizing energy consumption. 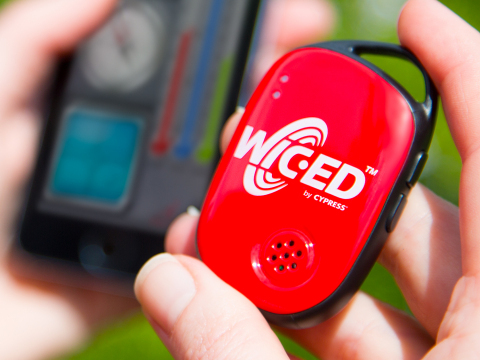 The WICED SDK provides code examples, tools and development support for the CYW43907. The WICED platform supports a broad range of other popular cloud services and eliminates the need for developers to implement the various protocols to connect to them, reducing development time and costs. The WICED Studio SDK enables cloud connectivity in minutes with its robust libraries that uniquely integrate popular cloud services such as iCloud, Amazon Web Services, IBM Bluemix, Alibaba Cloud, and Microsoft Azure, along with services from private cloud partners and China’s Weibo social media platform. In line with the IoT trend toward dual-mode connectivity, the kit supports Cypress’ Wi-Fi and Bluetooth combination solutions and its low-power Bluetooth and Bluetooth Low Energy (BLE) combination solutions. The SDK features a single installer package for multiple wireless technologies with an Eclipse-based Integrated Development Environment (IDE) that runs on multiple operating systems, including Windows, MacOS and Linux. Cypress’ WICED Studio connectivity suite is microcontroller (MCU)-agnostic and provides ready support for a variety of third-party MCUs to address the needs of complex IoT applications. The platform also enables cost efficient solutions for simple IoT applications by integrating MCU functionality into the connectivity device. Wi-Fi and Bluetooth protocol stacks can run transparently on a host MCU or in embedded mode, allowing for flexible platform architectures with common firmware. Cypress is the leader in advanced embedded system solutions for the world’s most innovative automotive, industrial, home automation and appliances, consumer electronics and medical products. Cypress’ programmable systems-on-chip, general-purpose microcontrollers, analog ICs, wireless and USB-based connectivity solutions and reliable, high-performance memories help engineers design differentiated products and get them to market first. Cypress is committed to providing customers with the best support and engineering resources on the planet enabling innovators and out-of-the-box thinkers to disrupt markets and create new product categories in record time. To learn more, go to www.cypress.com. Cypress, the Cypress logo and WICED are registered trademarks of Cypress Semiconductor Corp. Apple, Siri, iPhone and iPad are trademarks of Apple Inc., registered in the U.S. and other countries. HomeKit is a trademark of Apple Inc. Decora Smart is a trademark of Leviton. All other trademarks are property of their owners. Cypress announces support of iCloud remote access for HomeKit Accessories with new WICED® Studio Software Development Kit and CYW43907 Wi-Fi® MCU.